Are you thinking about buying a Brother MFC-J450DW Wireless Office All-In-One Printer/Scanner/Copier/Fax Machine and wondering if it will work with your Ubuntu computer? The answer is YES! Brother actually includes Linux on their Supported OS Page. I was able to get things working on Ubuntu 14.04 LTS "Trusty Tahr". The CD provided with the printer contains Drivers, Utilities, and Users Manuals, but only for Windows and Macintosh computers. To get the Linux Drivers, you must visit the MFC-J450DW Downloads Page. Select Linux as the OS and Linux (deb) as the OS Version or go directly to this page. Follow directions to download and install the Driver Install Tool. You should also be able to scan with the application Simple Scan which comes with Ubuntu. If you would rather not install any software on your computer whatsoever, the MFC-J450DW makes this possible. I actually prefer this because it makes it easy to print and scan to and from any device you might have including Macs and iOS devices. Another option is to setup Google Cloud Print which lets you print from any device via your Google Account. Brother's Google Cloud Print Instruction Page just tells you to find the right manual for your model. If you visit the Brother MFC-J450DW Manuals Page, you will see the Brother Google Cloud Print Guide Page which let's you download the actual Brother Google Cloud Print Guide [PDF]. To save time, just make sure you have a Google Account and then go directly to your printer's admin web interface which is accessible via a web browser at http://[PRINTER_IP_ADDRESS]/ where PRINTER_IP_ADDRESS is the address of your printer on the local network. I was able to obtain this IP address by looking at my router's list of connected clients. You can also find out via the printer's control panel by selecting Menu -> Network -> WLAN -> TCP/IP -> IP Address. The printer's Google Cloud Print admin page, at http://[PRINTER_IP_ADDRESS]/net/net/gcp.html?pageid=1084, only let's you associate the printer with one Google account. However Google let's you share the printer with other people very easily. Another option for scanning is to use Brother Web Connect. Instructions can be found at the Brother Web Connect Page which lets you download the Brother Web Connect Guide [PDF]. I found it very easy to setup Web Connect for Google Drive and Dropbox. Other options available that I haven't tried yet are Picassa, Flickr, Facebook, Evernote, Onedrive, and Box. After you get it setup, you simply use the printer's control panel with WEB -> [Service] -> [Configured Service]. After scanning, the file will show up in your Configured Service in a folder called From_BrotherDevice. So easy! 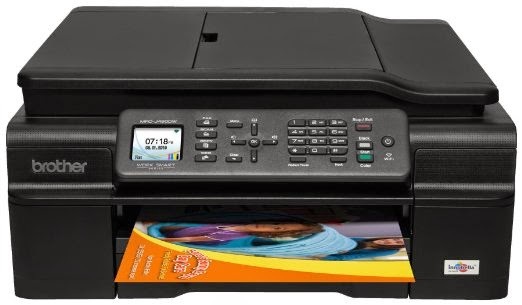 Please comment if you have any problems or other tips for people trying to get the Brother MFC-J450DW (or similar printer) working with Ubuntu. I just got my mfc-j450dw up and running. However I noticed that the ink is light. In OSX the blacks are nice and dark but in Ubuntu the inks just aren't printing very dark. Is there any alternative driver outhere ? Very nice! I came here to use my B MFC with Ubuntu, since I can put Ubuntu on my hardware including coexisting on a chromebook I have on order. But pointing out google cloud print and Brother scan-to-cloud is even better! I asked for .docx, and it did great OCR. Can any adjustments be made to things like dpi in scans or jpeg quality? You should tag this "chromebook" also!